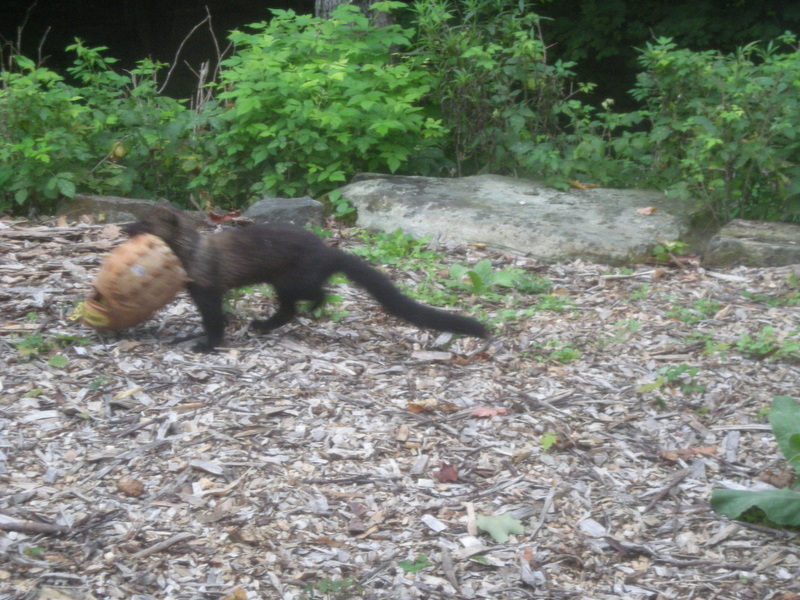 I snapped a picture of this Fisher (Martes pennanti) stealing my baseball glove! I chased this stocky weasel thinking it would drop the glove, but Fishers are so strong I never saw the glove again. Fishers are carnivorous but unlike their name) don't catch or eat fish. They may have been named by early Dutch settlers after the European Polecat known as the "Fitchet." Fishers are about the only successful predators of the Porcupine. So, does anybody have any ideas why the Fisher wanted the baseball glove? Bring your tree questions and stories to the Woodlands and Wildlife Forest Festival hosted by the Muskoka Conservancy and Westwind Forest Stewardship on Friday November 14, 2014. 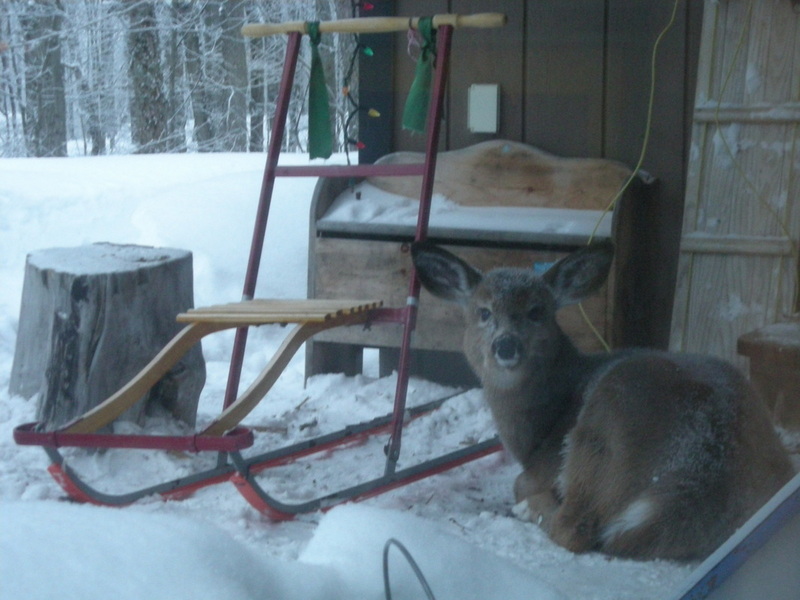 The $50 registration fee ($30 for students) covers a full day of workshops and presentations on topics such as, wildlife friendly forestry, species at risk, forest health, invasive species, and living with deer. The event will take place at the Active Living Centre, 20 Park Dr. in Huntsville. The keynote speaker is Michael Runtz, and lunch is included. Register online or by phone - jhead@muskokaconservancy.org (705)645-7393 ext.200. Don't miss it! A lot of insects that feed on Milkweed are black and orange. I found one today I had not seen before and I am guessing it is toxic to predators (or at least tastes yucky) with those bright warning colours. 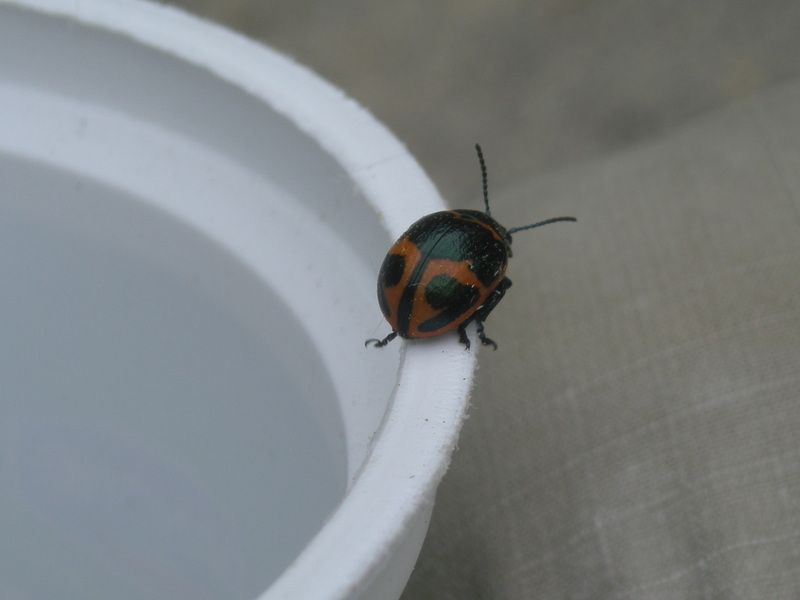 The Milkweed Leaf Beetle (Labidomera clivicollis) feeds on Swamp and Common Milkweed and prior to leaf meals, clips the side veins to drain some of the sticky sap. 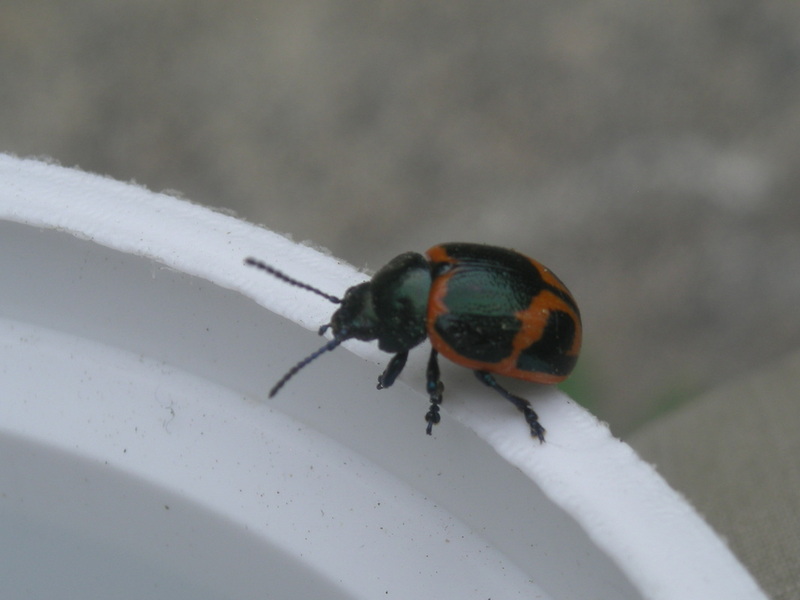 This gorgeous beetle is about a centimetre long with a green thorax and black and orange elytra (which can vary considerably). Resolving the Dichotomy on May 8-9 2014 and although I only attended one of the two days, I can report it was exceedingly successful. Kudos to the organizers for tackling one of the most challenging dichotomies we face as a species – and one we don’t actively discuss because it seems so impossible to solve. Yet, the presenters at the conference spoke about this topic with confidence when clarifying problems (with world class expertise) and offered the most creative and contemporary solutions that exist today. The conference opened with a five-minute video about Muskoka and the Friends of the Muskoka Watershed (see http://www.muskokawatershed.org/fmw1/about-fmw/) and an original song performed by two high school students. Robert Sandford, one of Canada’s most respected water policy experts from the University of Saskatchewan, creatively shared the social, economic, and political Consequences of Hydro-climatic Change. He is the author of Cold Matters-The State and Fate of Canada’s Fresh Water. Elena Bennet from McGill University spoke about agricultural landscapes and how they can provide us with things that we need called- ecosystem services. She offered a new way of looking at landscape planning, while interacting with biodiversity and multiple ecosystem services to meet the needs of a growing global population. Another researcher from the University of British Columbia whose important work also contributes to policy and decision-making is Kai Chan (see http://chanslab.ires.ubc.ca/people/chan/). He argues the way humans currently use resources not only results in environmental problems but economic ones too. He offered creative economics for mitigating problems “upstream” by investing and offsetting (see http://www.offsetters.ca/). The Keynote speaker at the conference was renown artist Robert Bateman. He pointed out that in 1930, there were 2 billion people on the Earth. Now there are 7 billion. It took 500,000 years for the first billion and 13 years for the last billion. His message was clear – the planet cannot sustain any more rapid growth. Bateman urged us that this does not mean a negative lifestyle outcome. Changes needed are based more on a philosophical shift. It means simpler, more meaningful lives connected with nature and closer to home. Mr. Bateman donated thousands of dollars worth of his art in support of the MSE Research Grant. In the below download file please find the Notice of Public Information Centre (PIC #2) for the Mountview Wastewater Treatment Plant and Huntsville Sewage Works Upgrades Class Environmental Assessment. PIC #2 will be held on Tuesday, April 15th in the Town of Huntsville at the Active Living Centre of the Canada Summit Centre. This summer, the WCE is developing a centre of excellence. The focus of the centre is to contribute to business development for entrepreneurs. A second lab will be built to provide services for companies to develop and/or test products related to clean water technologies such as domestic septic treatment. Developing technologies such as these will contribute to maintaining the health of the Muskoka watershed and will promote business opportunities for the region. The new lab will also help expand the lake monitoring program (such as heavy metal testing). If anyone from the Lake Vernon Association is keen to help out with funding, please contact Dr. Colin Yates at (226-220-0133). The Muskoka Conservancy's Spring Shoreline Workshops are here! These all run in the evenings from 7pm till 9pm. All workshops are free but they fill up fast so pre-registration is recommended. Call (705) 645-7393 ext. 200 or e-mail info@muskokaconservancy.org to reserve a spot and for details on workshop locations. The Muskoka Conservancy is hosting a separate professional development opportunity called "Working Around Water" on Wednesday, March 26 from 9am-4pm. Topics will include erosion control, permitting & planning, septic technology & site planning, and landscaping. Cost is $50. Call (705) 645-7393 ext. 200 or e-mail info@muskokaconservancy.org to register. A blog (a contraction of the term "web log") is a type of website, usually maintained by an individual with regular entries of commentary, descriptions of events, or other material such as graphics or video. Entries are commonly displayed in reverse-chronological order. Blogging is a great way to share thoughts, ideas and information from various sources to a group of people. It is a fast way to get information onto a web site. If you have a comment, idea, complaint, suggestion or anything to say about Lake Vernon or the LVA we encourage you to submit your post to us. Really you can blog whenever you have something to contribute. Postings can be submitted by anyone who is a member of the LVA. If you wish to submit a posting please use the Contact Us form. We welcome your thoughts on the lake and anything you wish to rant and rave about! If you wish to comment on a FrogBlog posting simply click on 'Comment' beside the posting, complete the form and post your own comment. When submitting posts or comments for the FrogBlog please ensure that your content is of a mature subject and free of coarse language. Together, we share the responsibility of preserving the natural beauty of Lake Vernon’s shoreline.